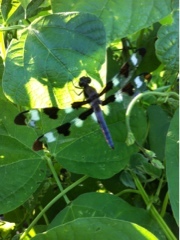 We thought it would be easy to identify this dragonfly. Such a clear, crisp photo, taken at close range, using the zoom feature on the phone. Instead we discover that there are thousands of varieties of dragonflies. Thousands?! Who knew? And the males and females can be slightly different. And the young can differ slightly from the old. Had to give up, as there is work to do. Knowledge that while the work of farming is being done, there is still work of reduction of mosquitoes, gnats, flies and just about anything else that takes to wing being conducted by the dragonflies that are all over the farm right now. Dragonflies need water to be born, and different varieties hatch out in different water conditions: standing, slow moving, fast currents, and even spots that fill in after a heavy rain and disappear in a short while. This one posed nicely for a picture while it was at rest. By all accounts the dragonfly usually is eating: it can consume its own weight in mosquitoes. That kind of action makes them very welcome here.